Altocumulus duplicatus clouds are considered to be one of the hardest types of cloud to identify. This is because of the double layer that exists in the cloud wherein the lower layer is more clearly visible, and the upper layer is sometimes not immediately visible. What height are altocumulus duplicatus found? Altocumulus duplicatus clouds are formed at the same range as other altocumulus clouds meaning at about 6,500 feet and more although it is rare that these clouds extend beyond 16,000 feet. 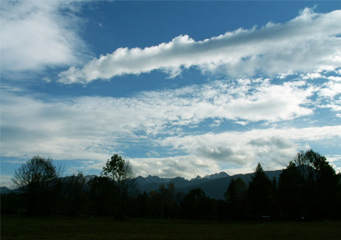 The cirrostratus duplicatus and cirrus duplicatus clouds, while these are placed higher up they are easier to identify compared to the duplicatus clouds placed at the other levels. How are altocumulus duplicatus clouds formed? The altocumulus duplicatus clouds are formed by the accumulation of water droplets and a mixture of warm air. By contrast the cirrostratus duplicatus and cirrus duplicatus clouds are formed by ice crystals. What do altocumulus duplicatus clouds look like? The altocumulus duplicatus clouds tend to be less opaque and therefore it is harder to see the two layers of the altocumulus duplicatus clouds. However at sunset when the sun is lowest in the sky, the layering of the clouds is more pronounced. This is because the lower layer of the altocumulus duplicatus tends to be darker and the layering therefore becomes more visible. How common are altocumulus duplicatus clouds? It is suspected that the altocumulus duplicatus clouds are actually quite common although because they are difficult to identify taking into account the problem in determining whether there are indeed two layers of cloud covering, the frequency of reported sightings of such cloud formations is substantially reduced compared to other types of cloud formation. Where can I see altocumulus duplicatus clouds? Altocumulus duplicatus clouds are also visible everywhere in the world although because they are harder to identify, it can sometimes be confusing. The best time to identify altocumulus duplicatus clouds are when there is a sunset as the color hues of the upper layer and lower layer of the duplicatus are often bathed in different colors or shades of red, orange or purple.